Breathing Space provides a rural church base in an idyllic setting for groups, organisations and individuals to explore and improve their overall health and well-being. We run courses, activities and events that make use of our beautiful 800 year old church environment (St. Michael’s & All Angels Church) and local nature reserve (Witton Dene). Our activities are informed by the Five Ways To Wellbeing: Connect, Be Active, Take Notice, Learn, and Give.We are committed to a caring and compassionate response to people’s needs that has, as its source, an open, inclusive & non-discriminatory Christian spirituality. Encouraging individuals to explore creative ways to maintain positive health & wellbeing. County Durham and Darlington have some of the highest levels of worklessness, with mental health cited as the number one cause. The practical activities will allow participants to remove themselves from familiar and anxiety-making surroundings. By focussing on a new practical challenge, participants will improve their confidence and self-esteem. We use the local natural environment to support physical, mental & emotional wellbeing and encourage participation as a pathway to physical activity and as an antidote to social isolation. Groups of volunteers working together and tackling new challenges will create a stronger local community; and courses and events run from the church will enable new friendships to form. The work undertaken in Witton Dene and in conserving the network of footpaths will provide opportunities for learning, and improve the natural environment for everyone from dog-walkers to bird-watchers. Exercising and spending time in the fresh air are vital to emotional and mental well-being. Our Project Office is Gillie Boggon who comes to us with a wealth of youth and community work experience. 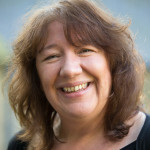 Her background is mainly within secular Youth work with Durham County Council, managing buildings, staff and volunteers as well as developing a programme of work to support the personal and social development of young people. With two grown up sons, Gillie lives with her husband near Chester-Le-Street and worships at a local church. She enjoys walking, reading and listening to music.